Home Office order Trenton Oldfield out of the UK, claiming that his “continued presence is not to the conducive good”. 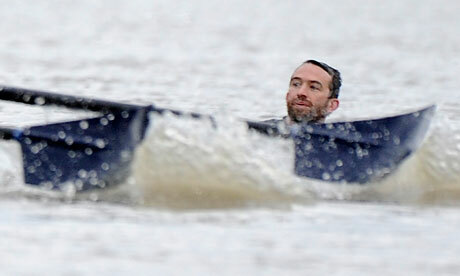 Trenton Oldfield, the Australian protestor who disrupted the 2012 Boat Race, has been ordered to leave the UK. The maverick Aussie, who has lived in the British Isles for a decade and whose British wife is expected to give birth this week, has been refused a spousal visa. The Home Office have informed Oldfield that his continued presence in Great Britain is “not to the conducive good“. Oldfield, who was jailed for six months after swimming in front of the crews during the 158th Boat Race, told the Guardian: “No one was expecting this. I have a tier one visa, as a highly skilled migrant, and I was sentenced to less than a year. 37-year-old Oldfield became infamous after taking the extreme step of disrupting the 2012 Boat Race, citing his actions as a protest against elitism in the UK. He got into more deep water last month when he accused Cambridge students’ fancy dress of endorsing “colonialism and racism” on Caesarian Sunday. The Boat Race, widely perceived as a symbol of the Oxbridge upper classes, was halted for 25 minutes, but Oldfield’s wife believes the punishment to be disproportionate. The family has launched an appeal, with Oldfield claiming that the deportation is in contravention to the European Convention of Human Rights, which offers the guarantee of a family life. They have the support of their local East London MP, Rushanara Ali, who said, “He has served his sentence and now his right to family life is being undermined.